Southern Cross, avigatig by the Stars in the Southern Ocean. The southern cross is the best known constelation in the southern hemisphere. However, unlike the navigator in the northern hemisphere, the southerner has no fixed star conveniently placed to mark the South Celestial pole. Quite the opposite, there is in fact an inky-black dark patch across that area of sky. This dark patch looking like a hole in the firmament is actually a cloud of gas obscuring any stars beyond, which has been appropriately called the ‘Coal Sack’. 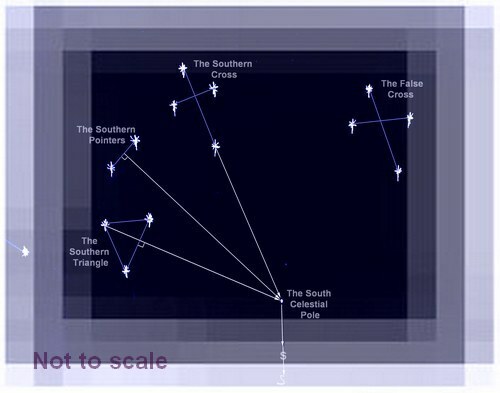 To find out where in this ‘coal sack’ the south celestial pole lies, there are, fortunately several ‘pointers’, the most famous of which is the Southern Cross. The Southern Cross, the constellation ‘Crux‘, is in one of the brightest portions of the southern Milky Way. It is also one of the smallest constellations. Fortunately three of its stars Acrux, Mimosa and Gacrux are among the brightest objects in the night sky. Counter clockwise next to Crux are another pair of bright stars Alpha and Beta Centauri which are known as the ‘Southern Pointers’. An imaginary straight line drawn clockwise across the pointers will point towards the head of the cross. It’s important to identify the cross using the pointers as there are several other cross like groups of stars, including the one known as the ‘false cross’. Once the cross has been correctly identified, if we draw an imaginary line through it’s head and carry it on through the bottom, somewhere along this line, where it crosses the ‘coal sack’ is the South Celestial Pole. If we then draw a perpendicular line from that imaginary line running between 'Pointer Stars' and extend this into the ‘coal sack’, where it crosses the line from the cross is the position of the South Celestial Pole. If this perpendicular line from the pointers were extended beyond the celestial pole it would point to Achernar a very bright star an equal distance beyond the pole. Another position line can be drawn from the ‘Southern Triangle’. A line from the apex of this star group cutting the base at right angles, then extended, will also cross the position of the South Celestial Pole. Terrestrial south is of course directly below the south celestial pole. 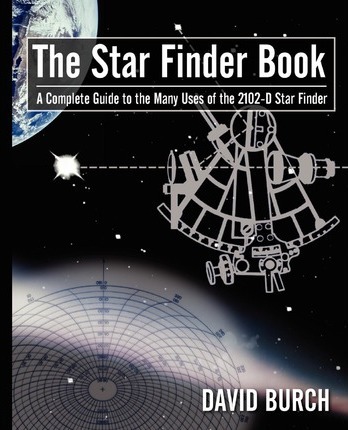 So while the navigator in the south does not have a conveniently placed pole star there are plenty of pointers to indicate the direction of south.